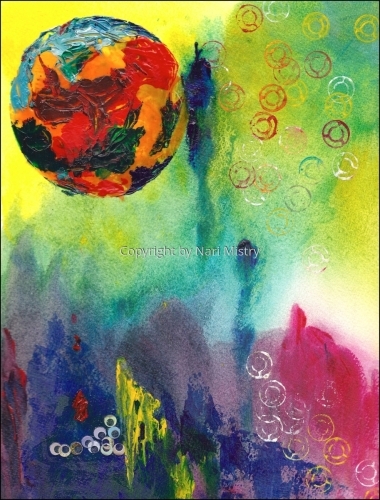 Color World is an abstract painting/collage in brilliant glowing acrylic colors on archival paper. Archival Giclee prints available on request. O ENCHANTED FISH !  This is the magic fish of Grimms fairytale. The fish is really an enchanted Prince, and grants the ever increasing wishes of the old fisherman and his greedy wife. It is painted using transparent acrylic pigments in layers that glow through each other. 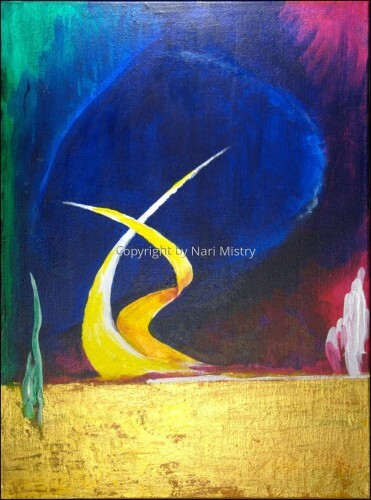 An abstract fantasy, "Harmony" shows two bright entwined shapes 'exploring' their relationship. The patterns in the glowing background reflect the swirl of the main shapes. A flat iridescent gold band defines the base of the painting, to avoid a 'landscape' effect. 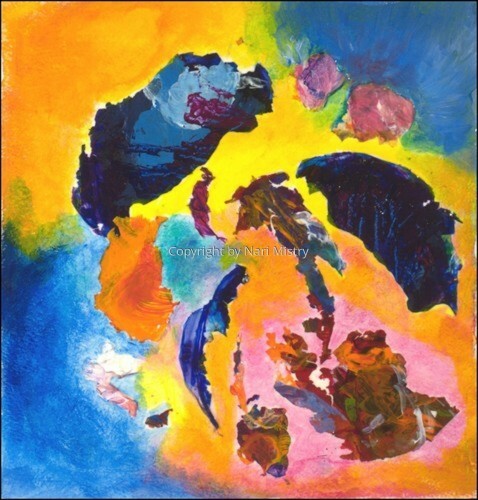 In this and some of my other acrylic paintings, I have used intense pure transparent & translucent pigments overlaid with transparent glazes, rather than mixing pigments to obtain different shades of color. 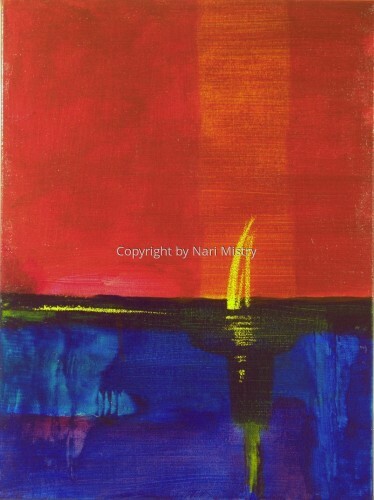 An abstract painting in brilliant transparent acrylic colors, "Quiet Evening" evokes a vision of quiet and solitude. Under the glowing surface, colors of the underpainting show through. The color fields are interrupted by slashes of bright yellow. 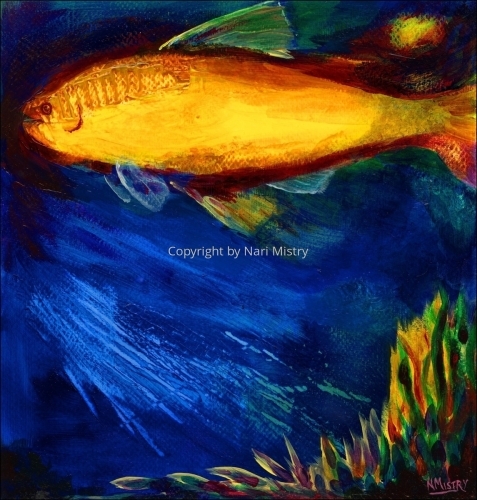 The original is sold, but Giclee prints on canvas available on order. Notecards available. "Color Islands" is a whimsical abstract piece with brilliant acrylic color "islands" glued to a background "sea" of bright colors. Lascaux --- There is nothing in art more awe-inspiring to me than these cave paintings in France, 17,000 years old! 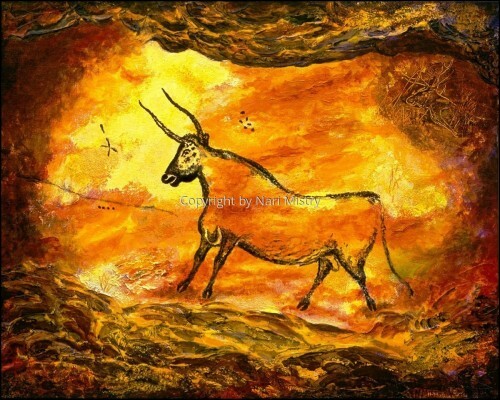 I have shown this magnificient Aurochs bull at Lascaux as it appeared to the artist just after it was finished by the light of tallow lamps, and before much of the surface fell off or other animals were painted over it. Try to picture the artist creating this immense work (it is 18 feet long!) deep in the dark cave and purely from the minds eye, without an animal to look at. 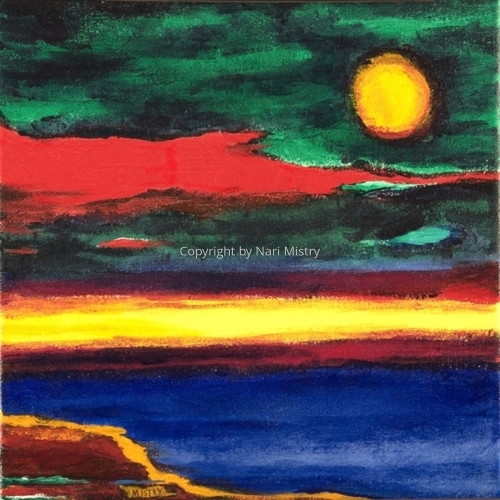 This painting is sold but Notecards are available. Flowers. 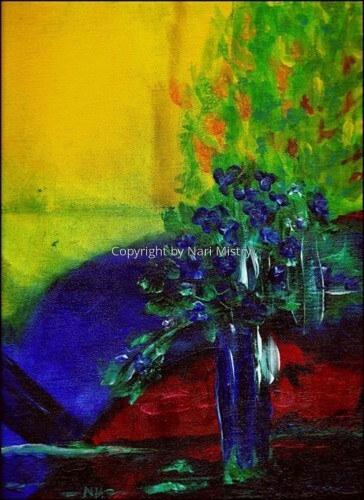 An impressionist still life of small blue flowers set in a scene of bold colors, illuminated by a pale yellow light from the window, with a subdued rose-bush glimpsed outside. Acrylic on canvas board (2007). Notecards available. Himalaya! 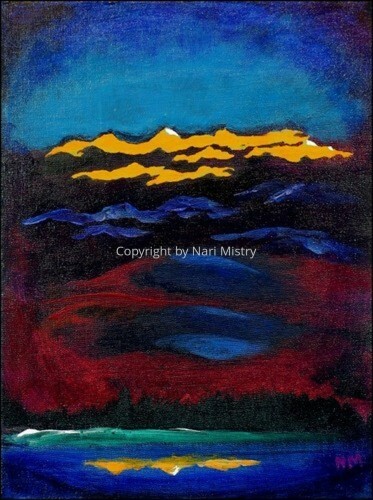 A surrealist view of brilliant sunlight just hitting the high peaks of the Himalaya, throwing a shadow on the clouds beyond, while the foreground mountains and hills remain in foreboding darkness with swirls of red amid the gloom. The sunlit peaks are reflected in an imaginary lake at the base. Acrylic on canvasboard, framed (2007). Costa Rica! 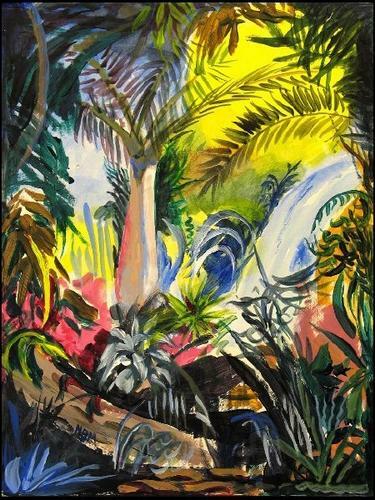 This is pure fantasy, based on a tropical forest scene in Costa Rica. 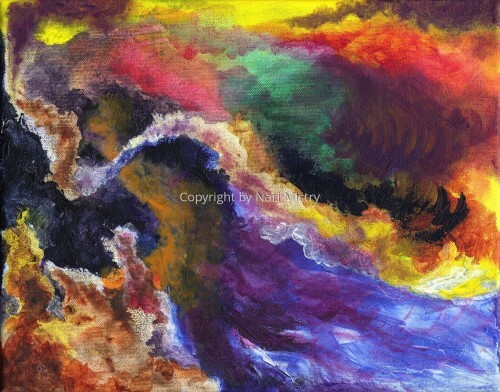 Acrylic on Canvas, (2006) "Cosmic Flow" is pure Fantasy, and may be imagined to represent the complex, convoluted flow of Space-Time in the Universe. 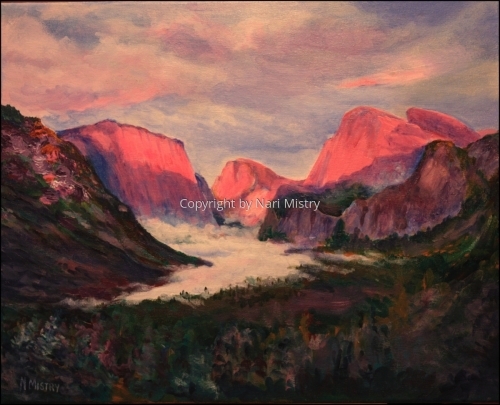 A larger Giclee print on canvas is available. Notecards available.